What is the Risk Management Plan? The Project Management Institute (PMI) defines Risk Management Plan in its Project Management Body of Knowledge (PMBOK) as "The process of defining how to conduct risk management activities for a project. The key benefit of this process is that it ensures that the degree, type, and visibility of risk management are proportionate to both risks and the importance of the project to the organization and other stakeholders. 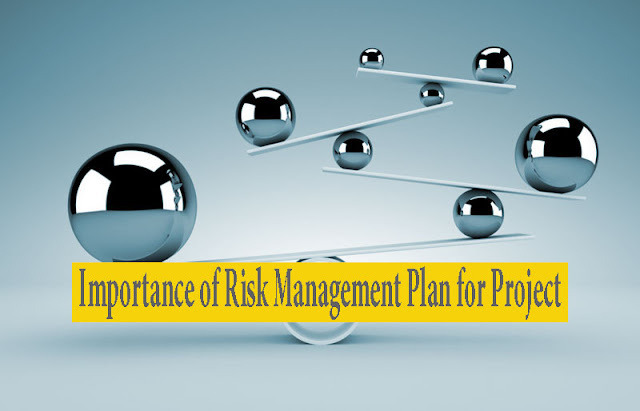 This process is performed once or at predefined points in the project"
What is the Importance of Risk Management Plan for Project? The quality of the risk management plan will control the usefulness of the risk analysis. This quality is achieved through developing a good and encompassing master risk register in a brainstorming workshop with experienced attendees, and following that process with analysis and risk allocation. This is combined with a process of continuing risk monitoring during updates as well as continuous cycles of risk management. Participants in the workshop will often comment that they cannot take certain risks into account because they do not have control of the risks or they have no idea if that risk will actually happen. One of the typical issues is repeated cycles of shop drawings, where experience tells us that a complicated design may cause structural steel shop drawings to be rejected, requiring revision and resubmission. Some stakeholders feel that this is beyond their ability to plan for and therefore, the schedule should ignore it and assume the risk will not happen. Accepting this assumption minimizes the risk identification and analysis process. This type of risk should be identified, and then during the qualitative analysis, it will be weeded out as a low priority or incorporated as a high priority. However, if the risk is just not included on the risk register, the opportunity to analyze it is lost. With a thorough and organized risk workshop, based on a good master risk register, and participation by the major stakeholders as well as the project management team, the output of the risk analysis will be very useful. The most likely risks will be identified and analyzed, and with the rest of the risk management steps, the schedule will evolve into a risk-adjusted schedule, capable of reasonable analysis and realistic completion predictions.